This week has gone nothing like what was set in my mind. I apologize in advance, but I am going to going with another blast from the past. This time from June 30, 2014. I should be back to regular stories and such next week. “Show off,” Trillin said. He put the rifle to his shoulder and aimed in on the target. She never had issues, he thought. She never missed, and he worked so much harder and still never measured up. “Fine, let’s head back to camp and get some food,” she said. “Why are you having so many problems with this?” Astric stirred the pot hanging over the gel fuel. He dug into the dirt with a stick. His troubles didn’t change when she left. They haunted him even more when she came home. Astric lost her hand to the war. The metal and gear replacement was even better than her original flesh and blood. She never failed, even when she failed. His failures, well, they were still failures. All of his problems came back to this one. He lived in her shadow, dwarfed by her accomplishments. “It just isn’t working, ok.” He turned away to watch the clouds chase the horizon. Wind whipped through his hair as he sighted in. Clear sight picture, clear mind, he took a deep breath and held it. As he let the air flow out of his lungs he squeezed the trigger. The burst of energy burnt into the target, direct center. He fired again and hit the mark a second time. “Apparently I needed the reminder.” He set the rifle down and grabbed the range finder. “What do you think that is?” He passed the range finder to Astric. The large object swooped down from the clouds in the distance. The best he could judge it hovered over their town, their home. “We need to get home. I don’t like the looks of that.” She saw smaller shuttles dropping down from the larger ship. A faint line that traveled into the city below. She studied his face. “I don’t know yet. But I’m going to find out.” She grabbed the rifle and ran to their sled. “Stay here, I’ll be back.” The engines roared to life and the sled lifted off the ground. Trillin remembered the pistol, buried in the tent in their climbing gear. Astric wanted to work on cliff assault runs later. She forgot the pistol in her haste to head home. He strapped the holster to his thigh and grabbed the climbing gear. She would never approve of him making a climb alone but he could get a better view at the top of Grizzly Peak. She smothered him, he thought. The peak climb wasn’t even a shear cliff. More like a walking climb with a bit of safety lines thrown in. He hooked into his climbing gear and used the spikes they left in the rock wall from yesterday’s climb. He reached the top of the rock wall a few minutes later, his fastest climb yet. Off in the distance he saw the glow of the sled’s engines. After adjusting the range finder, he pinpointed on the ship in the distance. From this angle he saw the insignia emblazoned on the side. A Federation ship, and Astric knew it. She wasn’t concerned with the state of things in town. She went for war, and shut him out, again. The sounds of the explosions carried by the wind all the way to Grizzly Peak. Then the smoke rose over the trees. Astric was gone from view, no chance to see her through the rising smoke. He watched as the smaller vessels rose back up to the other ship, silver drops in the black clouds of smoke. Hours passed without a word from Astric. The glow of the fire left from the explosions lit the distant sky. He set off on foot through the woods to find his sister. The glow of the burning city would guide him on the way. He donned his training armor, not as sturdy as full protective armor but still better than nothing. After switching on the low light setting of the visor he set off toward home. The sled had followed a set trail back to their settlement, he did the same to avoid the thicker parts of the wood. He found the sled at the wall outside the settlement. It no longer hovered, the nose of it jammed into the dirt as smoke rose from the engines. He looked but could not find Astric anywhere near the sled. “She could be alive,” he said. Dawn crept over the tree line. No bodies, living nor dead were seen on this side of the wall. He used a side path to cross through the wall. The fire and smoke were not enough to prepare him for the devastation on the other side of the wall. Buildings were shattered. Bodies littered the landscape. The shards of life he once knew, were now crushed and shattered. “Astric!” He called out for her and received no response. On the way to his home he worked his way through the debris. He searched for survivors along the way, but the streets were littered with the dead. His home fared no better. 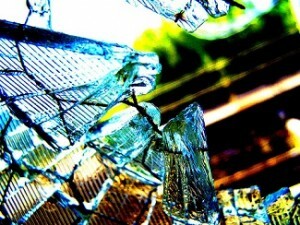 Shards of glass and broken construction were all that was left. He found her in the wreckage. In her last moments she sought to upstage him once again. She left him away from the danger, somewhere safe, while she risked her life to save their family. Little good it did her. Now he lives but the rest are gone. All of them, gone. He stepped back from inside himself and looked around the city again. Nothing was left, nothing but him. He was alone, lost and broken, the last shard of glass. 17 Responses to "Shards of Glass #scifi"
Not the ending I was expecting, but a strong story, for sure. I don’t think she was out glorying him particularly , but you’d know better than me. I would miss out the word ‘like’ in the last sentence. Makes a stronger statement. That is the interesting thing of his perspective. Be it jealousy or a need to prove his worth, he never really saw how much she wanted to protect him. But at the same time it is possible that she didn’t see his growth and ability to contribute. She rushed off to do her “duty” instead of holding back to assess the situation. But that’s what I get from the piece. I don’t have any siblings and have always watched their interactions with some amazement. Love and hate have never been so closely intertwined as they are between siblings. Now that I have my own children, i watch them dance the edge between kindness and cruelty on a regular basis. I optimistically note that the kindness seems to be taking precedence as they grow older. I know that feeling, at least with my own kids. They are each others best friends and worst enemies at the same time. My brother sisters all live in different parts of the country. We have never really been close. They are definitely strange, and everyone has their own horror stories that have been part of their family interactions. A nicely penned slice of sci-fi Jon. Let’s hope he’s learnt enough to make it on his own. It looks like he will have to come to grips with life on his own pretty quick. Nice science fiction and loved that last line! Thanks. It feels like it’s been forever since I spent time with some science fictiony words. Are they trying to protect us or grab all the glory for themselves? War always feels distant and doesn’t weigh on your mind, until it comes to your doorstep. I am currently looking at the different avenues that I will pursue in the next year. Right now I have a backlog of stories waiting for the time they will be shared. Maybe over the coming months I might put out some feelers to find what stories readers would like to read more of. Could make for an interesting road to pursue. That’s the hard part about being the elder sibling — you never learn how to delegate. I liked the setting/world here, but it made me wonder what kind of society they had when there was such a big emphasis on combat training. Sounded like a scary place. Life can be scary at times. At some point more of this universe will need to be explored.